From the well-publicized events at San Francisco State in 1968 to the image of black students with guns emerging from the takeover of the student union at Cornell University in April, 1969, the struggle for a more relevant and meaningful education, including demands for black and ethnic studies programs, became a clarion call across the country in the late 1960s. 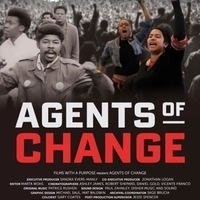 Through the stories of these young men and women who were at the forefront of these efforts, the film Agents of Change examines the untold story of the racial conditions on college campuses and in the country that led to these protests. The event will include a pre-screening reception and a post-screening discussion with the filmmakers, Abby Ginzberg and Frank Dawson. Questions and requests for accommodations to Mary Goodman. This event is part of Georgetown University's "Let Freedom Ring!" initiative honoring the legacy of Dr. Martin Luther King, Jr. This was a very good program that told the story of student rights. I loved the information I learned from the movie, and learned so much from the filmmakers as well as others in this intergenerational audience.